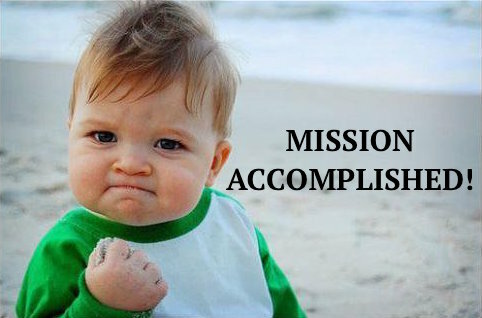 Unit 1: Geography, Government and Economics, Oh My! Activity 1: Write the Lesson Mission Statements below in your Lesson Chronicles on the Lesson 2 Physical Maps Page found under the header "Lesson Mission." I can define the term, "physical map." I can identify and describe the 14 physical regions of the United States. Activity 2: Read the Lesson 2 Text below. Match the vocabulary words and their definitions in your Lesson Chronicles on the Lesson 2 Physical Maps Page found under the header "Lesson Vocabulary." Physical maps are maps that show the natural details and landforms, terrain, and bodies of water of an area using different colors, lines, and symbols to show elevation and types of land and often show political boundaries as well. Physical maps show us regions that have the same physical characteristics. These characteristics include mountains, deserts, plains, forests, wetlands, rivers, lakes, seas, and other bodies of water. Physical maps also show climates and weather patterns, types of soil, and the built infrastructure of a region, such as roads, railway lines, and buildings. 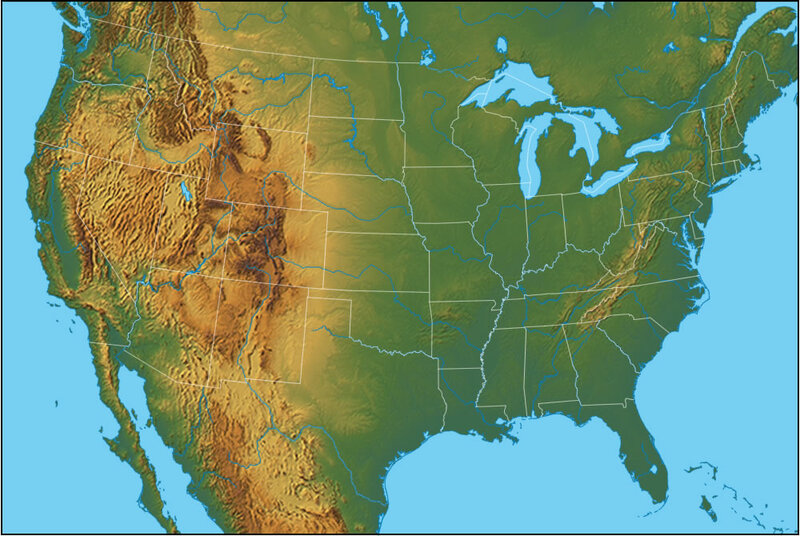 This physical map shows elevations in the United States by highlighting plains and mountains. It also shows the contrast between lush and desert regions. Notice that the states are outlined but not labeled. This physical map shows roads, rivers, major cities, capitals, and states. In your small groups look at the document above. Be sure to scroll down so you can view the whole document. Read the boxes together. What else do physical maps tell you? As a group, make a list of the things that you learned from these maps. We will discuss this in whole group. The United States has several major physical regions but in order to discuss the location of these regions, you need to know your states. Below is a map of the United States. As you know, Hawaii and Alaska are not in the Southwest. 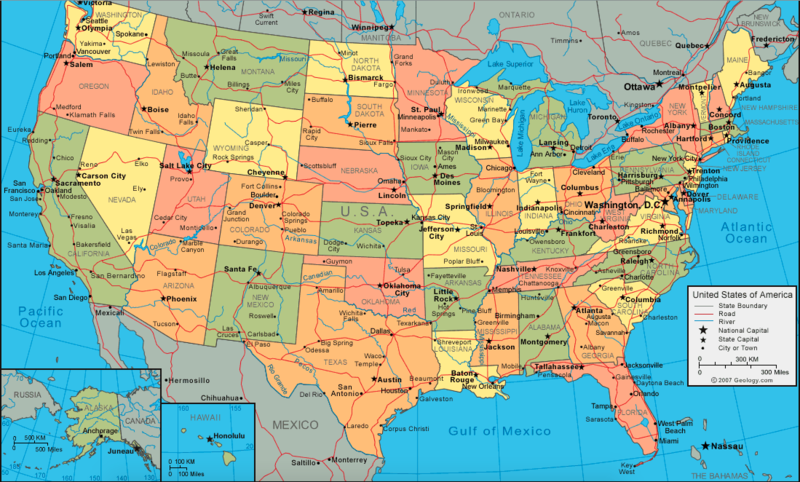 Because it is difficult to label all the states where you can see them and show where these states are in the world, map makers often crop these two states and paste them near the continental United States or the 48 states of the United States that are connected on the continent of North America. The map below shows the actual location of Alaska and Hawaii. 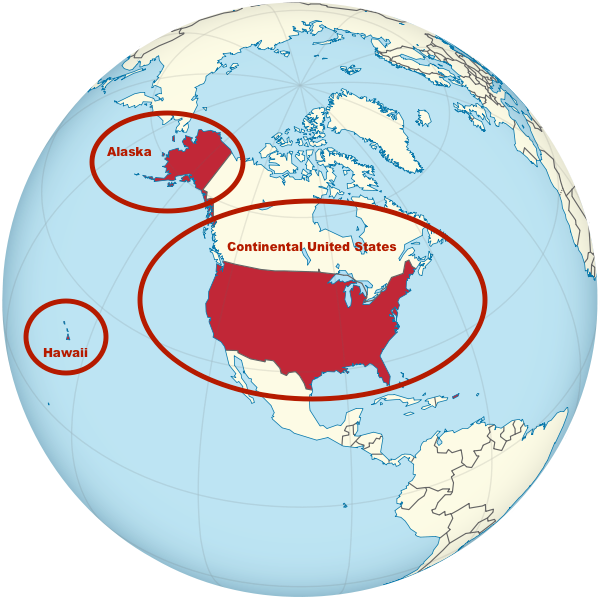 With this map, you can see how difficult it would be to label the continental United States while showing the actual location of Hawaii and Alaska. Because this is a world map, you can also make some inferences about the different physical features in the United States. The United States has a variety of climates and terrains because it covers such a large area. A bush region is a region that is not very developed or populated. The Alaskan Bush Region is part of the tundra biome. The tundra is the coldest biome where there are very few plants and trees and is usually covered in snow and ice all year round. The Alaskan Bush is located in the northern portion of Alaska. This region of Alaska is sparsely populated by native peoples and not connected to the North American Road Network. The Alaskan Bush Region is known for the aurora borealis or "northern lights" that may be seen from late August through April. The lights are created when solar winds interact with the earth's magnetic field. This area is rich in coal, petroleum and natural gas. An interior region is the center most portion of a large region. The Alaskan Interior Region is part of the taiga biome. The taiga biome is a cold region that contains mountains covered in boreal (or snow covered) forests of cone producing trees such as alpine trees pine trees, and fir trees. The Alaskan Interior Region has a small population of people who live in or near Fairbanks, the 2nd largest city in Alaska. This area is best known for the Klondike Gold Rush between 1896 and 1899 when people flocked to the Interior Region in search of gold. A panhandle is a narrow portion of land in a region that sticks out from the larger main region making it resemble the handle on a frying pan. The Alaskan Panhandle a large group of islands. An island is a landmass that is surrounded by water. These islands are a part of the temperate rainforest biome. Temperate rainforests are forests that contain many different types of trees in areas with mild climates that get heavy rainfall. The Tongass National Forest is located in the Alaskan Panhandle and is the largest temperate rainforest in the world. This region is largely protected because of the many different ecosystems that exist in the area. An ecosystem is a complex set of relationships between living things and their habitat. It is the way that living things affect their environment and the way the environment affects the living things within it. The world’s largest population of humpback whales inhabit this region in the summer. This region is rich with sea life, vast forests, and beautiful landscapes. So their economy revolves around the seafood, timber, and tourism industries. The Aleutian Islands begin as a peninsula that extends from the mainland and then breaks up into many islands. A peninsula is land that is surrounded on three sides by water. It extends from the Alaskan mainland out to the Southwest. The Aleutian Islands are in a coastal tundra. A coastal tundra is simply a tundra on a coastline. This makes the climate and landscape different from a regular tundra. The peninsula has mountains, volcanoes, and wetlands with vast forests and a great amount of wildlife. Wetlands are land areas that stay wet including swamps, bogs, and marshes. The islands have volcanoes and mountains. They are almost treeless but have vast areas of lush grasslands. This is because the coastline weather is harsh in this region. High winds called williwaws smash into the coastline at speeds of 100 mph. South Central Alaska is a gulf coastal region. A gulf is a part of an ocean that is surrounded by land on three sides. It is the opposite of a peninsula. South Central Alaska contains a variety of different landscapes and climates and it is hard to place it into one particular biome. This region is where the earth's tectonic plates collide resulting in active volcanoes and earthquakes. Tectonic plates are large flat slabs of rock that float on and travel over the Earth’s mantle and cause earthquakes and volcanoes to erupt and earth. The coastline areas have giant fjords where glaciers show over the top of the gulf waters. A fjord is a long, narrow sea inlet that is bordered by steep cliffs. A glacier is a large area of thick ice that remains frozen from one year to the next. The South Central Alaskan Region has a largest delta in the Western Hemisphere. A delta is a low, watery land formed at the mouth of a river when the silt, sand, and small rocks that flow downstream in the river and are deposited at the river’s mouth. The delta is Alaska’s only fertile farm land. On March 24, 1989, the Exxon Valdez oil liner hit a reef here spilling approximately 10 million gallons of oil into ocean. Much of the region's wildlife was killed or endangered as a result of the environmental disaster. Highlands are landforms that are elevated and include hills, mountains, and plateaus. Plateaus are large flat areas of land that are higher than the surrounding land. Plateaus look like mountains with the top sliced off. 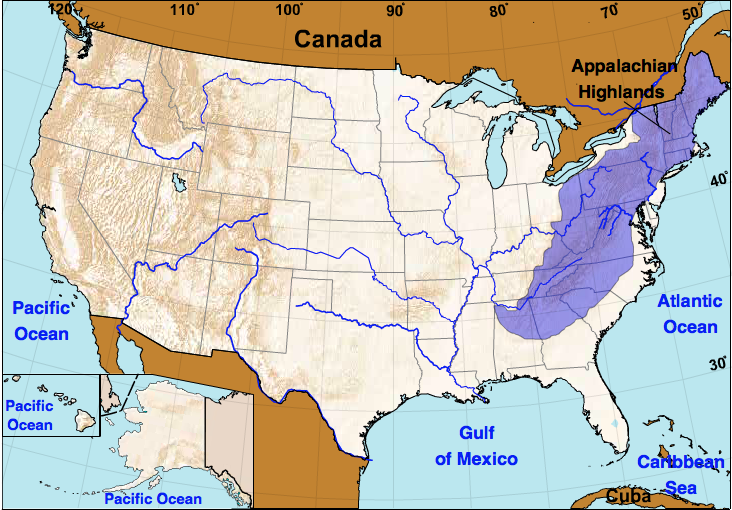 The Appalachian Highlands stretch from Central Alabama all the way to Southern Canada. They are mostly temperate forests. Temperate forests are forests that do not have extreme temperatures. They are located between tropical rainforests near the equator and boreal forests near the North Pole. Temperate forests contain deciduous trees. These are trees with broad leaves that change color in autumn and fall off the trees in the winter. The Appalachian Highlands are rich in coal, iron, petroleum, and natural gas. It also has many streams, rivers, and lakes that produce hydroelectricity. Uplands are highlands that are usually far from a coast or sea. The Laurentian Uplands are also called the Canadian Shield and are a mixture of coniferous and deciduous forests. Coniferous forests are trees that produce cones, like pine trees and fir trees. It is between a temperate and taiga biome. 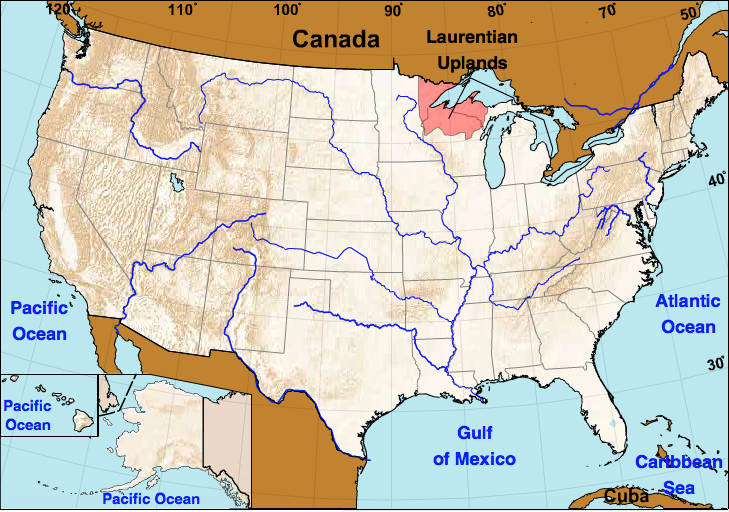 The Laurentian Uplands are located in parts of Northern Minnesota, Wisconsin, Michigan, and New York State. It contains the world’s largest region of forests and game animals providing a wealth of timber and furs to the world. Plains are large areas of flat land. The Atlantic Plains are also called the Coastal Plains because these plains mainly consist of the coastlines of the Eastern United States on the Atlantic Ocean and the Southern United States on the Gulf of Mexico. Most of the Atlantic Plains are below sea level. Sea level is the average level of the sea and is used to measure the height of landforms. This means that a large portion of the Atlantic Plains is actually below the level of the sea! The Atlantic Plains contain many wetlands like rivers, marshes, and swamps. This area has rich farm land. The inland areas of the Atlantic Plains contain many different types of trees which provide timber and help support the thriving paper making industries in the region. Because the Atlantic Plains are a coastal region, the seafood and tourism industries create a thriving economy here. The Interior Highlands is a small area that covers portions of Missouri, Arkansas, Oklahoma, and Kansas. The Interior Highlands have rolling hills and rugged plateaus and mountains. The region contains many springs, caves, and sinkholes. A sinkhole is a low area or hole in the ground that is formed when soil and rocks are removed by flowing water. This area is rich with a variety of minerals. A portion of the Interior Highlands is called the Lead Belt because it has the largest deposits of lead-zinc in the United States. The middle section of the United States between the Rockies in the West and the Appalachians in the East is a large lowland area called the Interior Plains. The dry western part of the Interior Plains is called the Great Plains. This area is a vast, dry, flat grassland with fertile soil for farming. The Great Plains are called America’s Bread Basket because it produces the bulk of America’s food. Some areas of the Interior Plains are rich in coal and petroleum. The Interior Plains cover the states of North Dakota, South Dakota, Montana, Wyoming, Colorado, Nebraska, Kansas, Oklahoma, New Mexico, and Texas. 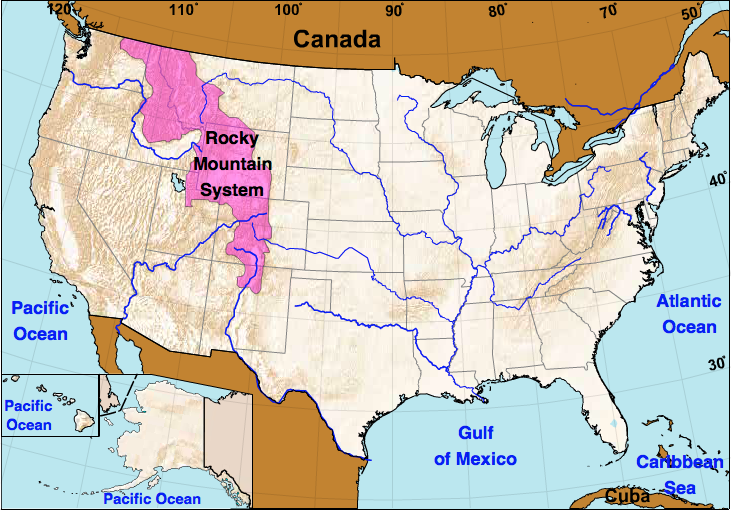 The Rocky Mountain System is a range of mountains that stretch from Alaska, Washington, Idaho, Montana, Utah, and Wyoming and down into Colorado, Arizona, and New Mexico. This system forms the Continental Divide. The Continental Divide separates the water that runs toward the Pacific Ocean from the water that runs toward the Atlantic and Arctic Oceans and the Gulf of Mexico. This mountain system contains the highest mountains in the United States. These mountains were formed by the great number of winding rivers in the area combined with years of erosion. Erosion is when something is gradually worn away by natural forces like water, wind, or ice. This area is rich with mineral deposits of lead, zinc, copper, silver, and gold. It was a popular destinations during the Gold and Silver Rushes in the early 1800s. The Rocky Mountain System has many national parks including Rocky Mountain National Park and Yellowstone National Park. One of the major attractions in Yellowstone is the geyser called Old Faithful. A geyser is a natural hot spring that regularly sprays boiling water and steam into the air. 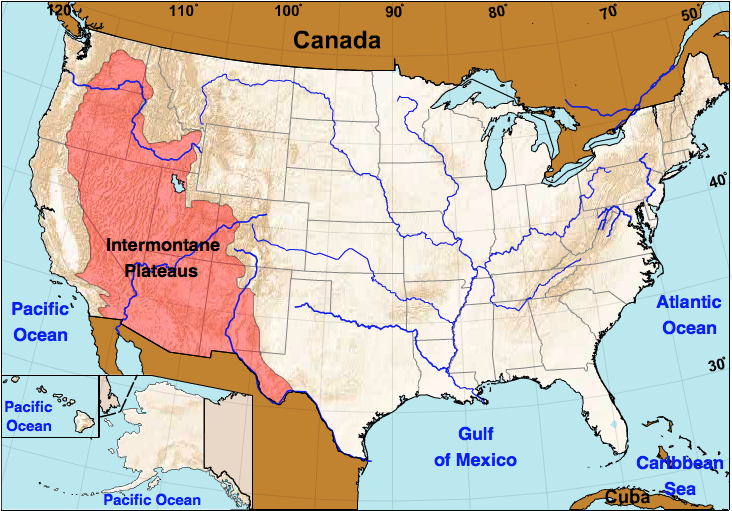 The Intermontane Plateaus are an area in the Western United States between the Rocky Mountains and the Pacific Mountain System that maintains a dry climate and contains a series of plateaus, mountains, valleys, basins, canyons, and deserts. A valley is a strip of land between mountains or plateaus. A basin is a dip in the Earth’s surface that is shaped like a bowl. The land surrounding a basin is higher like a sink or bathtub. Some basins are full of water and some are not. A canyon is a deep, narrow valley with steep sides that is created when rivers erode away rock and when tectonic plates move. Deserts are dry areas and receive less than ten inches of rain a year. Deserts usually have warm climates and few plants. The Intermontane Plateaus contains the Grand Canyon which is one of the seven wonders of the world because it is one of the oldest natural formations in the world. The Intermontane includes portions of the states of Colorado, Utah, Arizona, New Mexico, Washington, Oregon, and Idaho. This area is the second largest producer of copper in the world. The Pacific Mountain System is a mountain range on the western coast of the United States along the Pacific Ocean and extending through the states of Washington, Oregon, California, and Hawaii. The Pacific Mountain System was formed by faults and the movement of tectonic plates. A fault is a crack in the Earth’s surface that form the boundaries between tectonic plates. The pieces of Earth’s crust move along the fault over time causing earthquakes and volcanic eruptions. The Pacific Mountain Range has a unique landscape and climate. The region contains 10 of the 12 major soil types in the world. Some of the mountains in this system plunge directly into the Pacific Ocean forming a rocky cliffs. This region is home to the Hoh Rainforest in the Pacific Northwest, the San Andreas Fault in California, and Mt. St. Helens in Washington. The Hoh Rainforest is a temperate rainforest that receives 12 feet of rain a year! It looks like an enchanted forest where lush green mosses and furs cover the ground covered by a canopy of trees. The San Andreas Fault is a boundary between two of Earth's tectonic plates. It is responsible for the biggest earthquakes in California. Mount St. Helens is a volcano in Washington that erupted violently in 1980 after being inactive for 123 years! Mining, fishing, and tourism are the major industries of the region. The Hawaiian Islands are a group of volcanic islands in the Pacific Ocean that are lined with coral reefs. Coral reefs are made up of a long line of coral and lies in warm, shallow water. Coral is a hard material formed on the bottom of the sea by the skeletons of small creatures. The vast differences in elevation produce different types of landforms and climates within a small area including tropical rain forests, cool alpine regions, arid deserts, and sandy beaches. Hawaii’s climate and soil allows it to grow pineapples, papayas, sugarcane, and coffee. Hawaii’s mild climate, beaches, lush rain forests, and volcanoes make it a popular tourist destination. Hawaii also has a thriving fishing and seafood industry. Activity 3: Use the maps above to label and color the the U.S. States in your Lesson Chronicles on the Lesson 2 Physical Maps Page found under the header, "Lesson Maps." 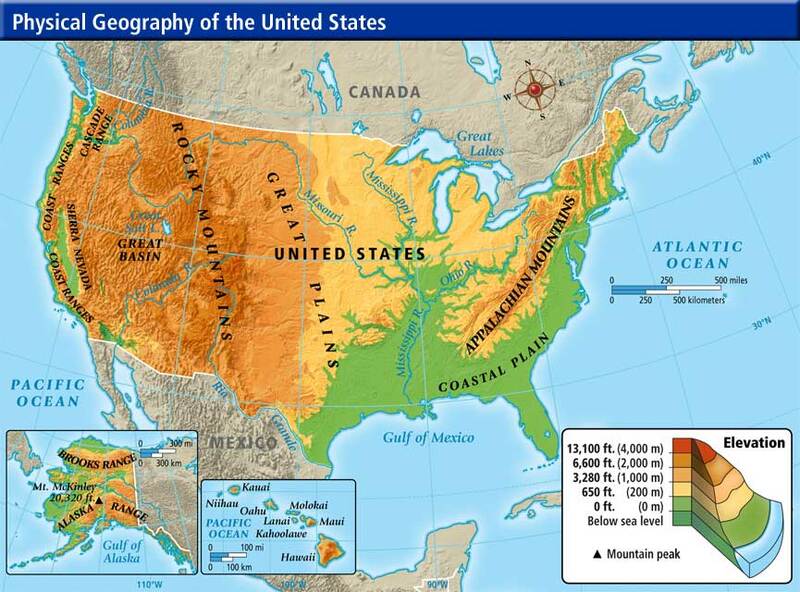 Activity 4: Use the maps and reading above to label the U.S. Regions in your Lesson Chronicles on the Lesson 2 Physical Maps Page, found under the header, "Lesson Maps." Activity 5: Use the maps and reading above to answer the questions in the graphic organizers of your Lesson Chronicles about each region. 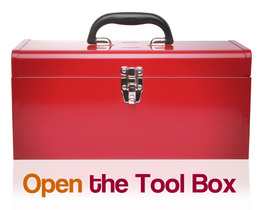 This activity is on the Lesson 2 Physical Maps Page, under the header Organize It. Activity 6: Apply what you learned about the states by clicking on the icons below and playing the U.S. States Games. Start with the Tutorial. Then move to Level 1 and then to Level 2 - You may practice with these at home too! ​If you'd rather put together a puzzle of the United States where the pieces are shaped like the states, you may come to the blue counter and get a puzzle box. Please make sure all the pieces are back in the box when you are finished. Activity 7: Apply what you learned about physical maps by clicking on the icons below and playing the Geographic Regions games. Start with the Tutorial. Then move to Level 1 and then to Level 2 - You may practice with these at home too! Yes? Great! Prove It! Take the Lesson Challenge by clicking on the icon below and see if you're right. Activity 8: Click on the icons below to test yourself. Practice as many times as you like. ​You have completed Lesson 2 - Physical Maps. Click on the button below to go back to the Topic 1 - Geography 101 Homepage.